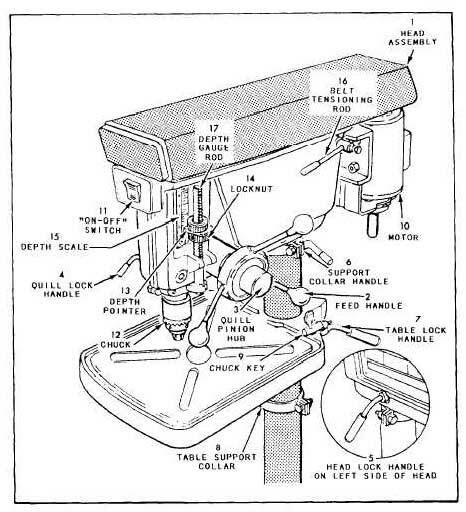 Home > Construction Training Manuals > Builder 3&2 Volume 01 > Figure 3-4.Drill Press. The on/off switch (11) is located in the front of the drill press for easy access. The spindle and quill feed handles (2) radiate from the spindle and quill pinion feed (3) hub, which is located on the lower right-front side of the head assembly (1). Pulling forward and down on any one of the three spindle and quill feed handles, which point upward at the time, moves the spindle and quill assembly downward. Release the feed handle (2) and the spindle and quill assembly return to the retracted or upper position by spring action. The quill lock handle (4) is located at the lower left-front side of the head assembly. Turn the quill lock handle clockwise to lock the quill at a desired operating position. Release the quill by turning the quill lock handle counterclockwise. However, in most cases, the quill lock handle will be in the released position. The head lock handle (5) is located at the left-rear side of the head assembly. Turn the head leek handle clockwise to lock the head assembly at a desired vertical height on the bench column. Turn the head lock handle counterclockwise to release the head assembly. When operating the drill press, you must ensure that the head lock handle is tight at all times. Figure 3-4. - Drill press.